Food lover and eater, O.D. The worst is over. During our 3rd year of school, we have our biggest proficiency called 5 stations. 12 skills. 2 hrs. 1 optometry student sweating bullets. And now I can put it all past me!!! No retakes and no worries (until boards). Whew! I can get back to a healthy eating, sleep and gym schedule again, as well as getting back to doing some real hobbies like baking and sewing. Now it’s a steady schedule of 1 exam/week and clinic. So excited to have a life again! And now for my return, a recipe for an easy and very fast weekday dinner! I found fingerling potatoes at the dollar store so I had to grab a few of those. They make for a good dinner side dish or breakfast side with eggs. For this recipe, though, you can really use any potato and any type of sausage you want technically. It’s the herbs that give it the flavor. I love using the fresh herbs I grow in pots, and they’re so easy to grow, too! You really just needed some good soil at Home Depot which is $8 for a huge bag (dirt is cheap…big surprise), a pot that can drain and remember to water it everyday. And even if you’re a forgetful person, you can at least grow rosemary which can live for a 1-2 days without water! Fresh herbs turn any simple dish into a hearty spectacular dish. Great way to add flavor when you’re in a rush! 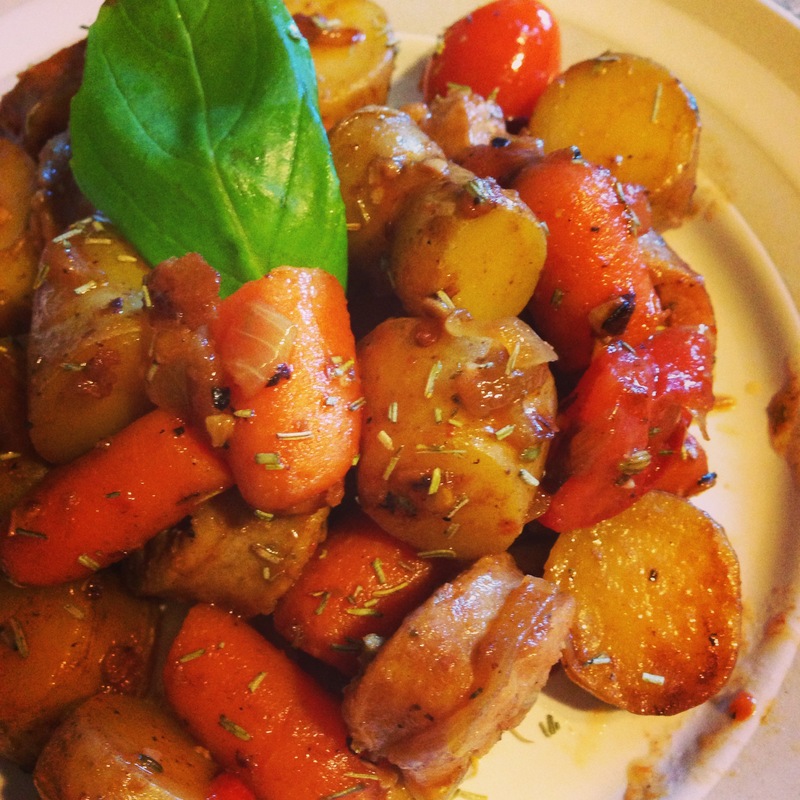 My boyfriend is a meat and potatoes kind of guy, so this recipe is also a sneaky way to add veggies and still make it yummy! Enjoy! 1. Spray a large skillet with non-stick spray and heat on med-high. Add your sausage and cook until they start to brown on all side. 2. Remove sausage and set aside. 3. Drizzle your skillet with olive oil and add in potatoes, carrots and onion. Cover and stir occasionally for 10 min. 4. When your sausage cools, slice your sausage into 1/2″ pieces. 5. Return sausage to pan. Add in garlic, tomatoes, garlic and rosemary. 6. Cook for another 5 min or until tomatoes are cooked. Salt/pepper to taste (about 1/2 tsp each). 7. Serve with torn pieces of fresh basil on top. Enjoy! I have clinic on Saturday mornings now, and it’s as bad as it sounds. However, having a delicious breakfast to munch on while works makes it infinitely times more tolerable for me and everyone else. 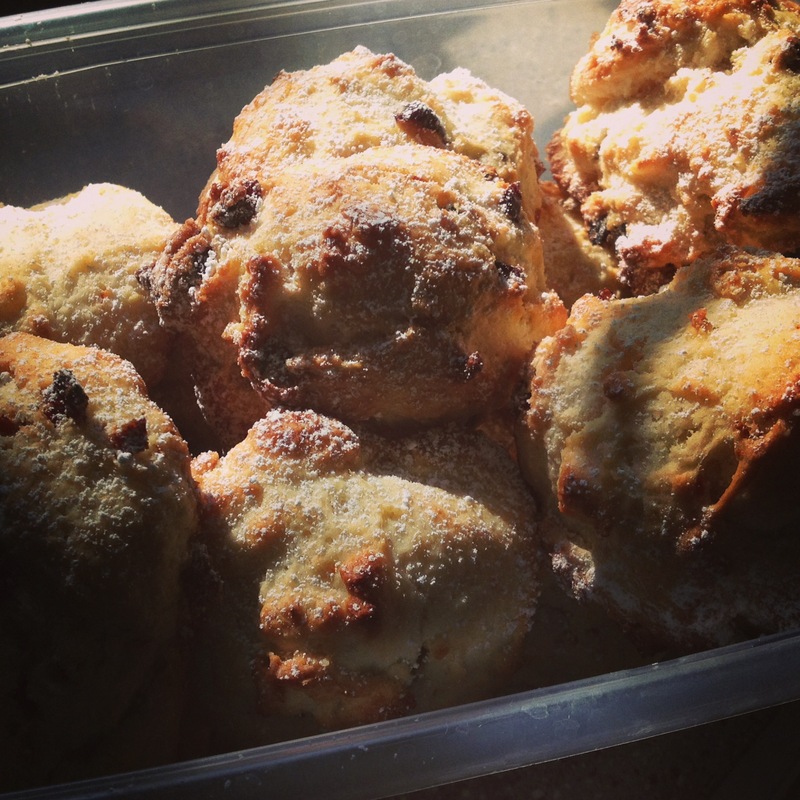 These scones are so quick and easy….quick enough for me to whip up right before work! I usually prepare the dry ingredients the night before and mix in the wet ingredients the next day, then just throw them in the oven! Sprinkle them with a little powdered sugar on top and they make delicious, not overly sweet breakfast treats that go great with coffee and tea! Perfect to impress friends and give their morning a kickstart! 1. Sift the dry ingredients together (flour, sugar, baking powder, salt). 2. Mix in the dried cranberries and orange zest. If you are doing this the night before, save the orange zest for the next day so it doesn’t dry up. 3. Mix the wet ingredients together. Make sure the buttermilk is room temperature so it doesn’t cool and clump up the melted butter. 4. Stir your wet ingredients into your dry ingredients JUST UNTIL everything is wet. If a little of it remains dry, that is Ok. Do NOT overmix!! 5. Make 16 plots on a baking sheet, preferably covered with parchment. I like to use an ice cream scoop and round out the base. 6. Bake for 20-23 minutes or until you see some golden brown edges. Sprinkle some powdered sugar on top for decoration and enjoy! Here’s another favorite of mine for a quick dinner. Not only is it healthy, but definitely some wonderful colors working in there. It’s surprising how one bell pepper can be so filling! Enjoy! 1. Cook your quinoa as instructed. If you cook it with a chicken or vegetable, it adds a lot of flavor to the quinoa. 2. After the quinoa is done, take it off the heat and slowly mix in 1-2 handfuls of spinach. 3. Dump the quinoa into a large bowl. Add in the corn, beans, tomatoes and cheese. The amounts listed are pretty relative. You can really add as much of each as you want. 4. Mix in the cumin and salt/pepper to taste. Add the chili powder if you want a kick to it. 5. Place your bell peppers into a pan. I like to use an oiled loaf pan so they stand up well. 6. 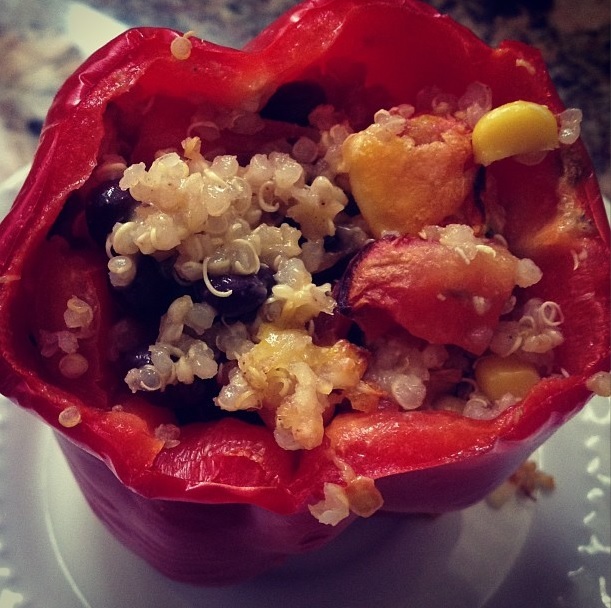 Spoon the quinoa mixture into the each bell pepper. Sprinkle some cheese on top. 7. Bake for about 25 minutes or until the filling is hot. The bell pepper will still have some bite to it.